(Bloomberg) -- Today in Brexit: EU leaders gather in Brussels to agree on a Brexit extension, likely a long period that Theresa May doesn’t want. It’s back to Brussels for another emergency summit and delay is on the agenda. Prime Minister Theresa May's plea for a short Brexit postponement, to June 30, has fallen on deaf ears. 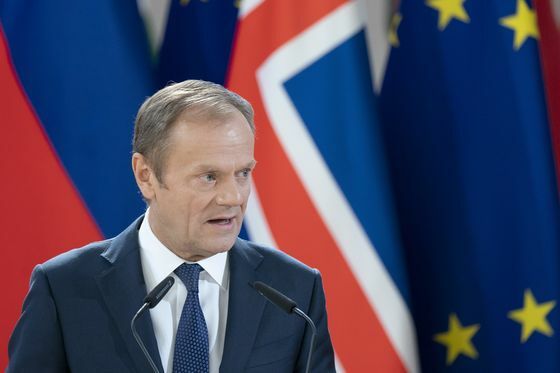 European Council President Donald Tusk is instead pushing for an extension of up to a year to avoid a rolling series of cliffhangers. The debate for EU member states now is whether the new departure date should be in December or next March, Ian Wishart reports. Draft conclusions from the summit show EU leaders are also planning to offer Britain an early exit option from the extension in case there's a breakthrough in the Westminster impasse. On the domestic front, a long postponement would spell a major political defeat for May, who had repeatedly promised to take Britain out of the EU by March 29. It also means the U.K. would participate in European parliamentary elections, which May had said she wanted to avoid. We're also still waiting for white smoke to emerge from the talks with the Labour party. The U.K.'s main opposition said last night that leaders had yet to see a clear shift in the government's Brexit position, meaning a compromise agreement is still out of reach. All this leaves May's position increasingly precarious, with her Conservative leadership rivals entering barely concealed campaign mode. IMF Gloom | The International Monetary Fund produced another gloomy analysis of the dangers of a no-deal Brexit, saying it could reduce Britain’s gross domestic product by 1.4 percent in the first year compared with what it would be if U.K. left with an agreement. That could rise to a 3.5 percent hit by 2021. Markets Trouble | A Brexit extension until Dec. 31—a date many EU governments seem to be coalescing around—would create a Christmas headache for investors, faced with the U.K. leaving at a time when market liquidity is particularly thin. 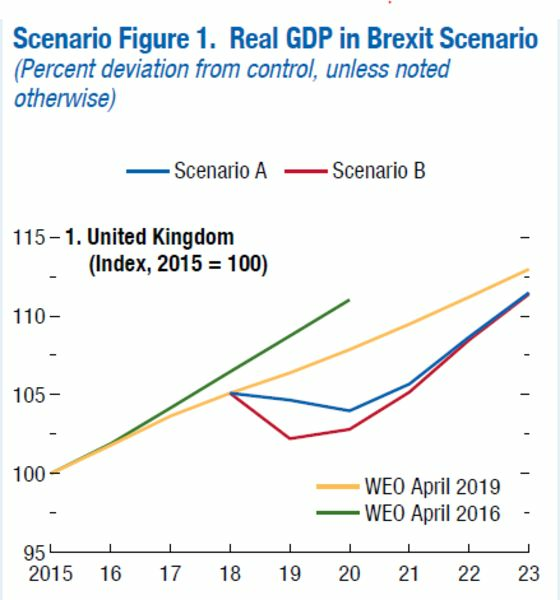 That would increase the risk of outsized moves in the pound or other U.K. assets. Prosperity Warning | EU Competition Commissioner Margrethe Vestager said Brexit will hurt prosperity in the U.K. and neighboring countries such as Ireland and the Netherlands. “We have prepared of course, but you cannot prepare away the effects of Brexit,” she said at a BBC World Service debate in Brussels on Tuesday. Medicine Shortages | Brexit contingency planning is contributing to a shortage of certain drugs at pharmacies, the Guardian reports, citing a body that represents the sector. Go Shopping | A lengthy Brexit delay could be a boost for Britain's beleaguered retailers as it might encourage shoppers to start spending again, Bloomberg Opinion's Andrea Felsted writes.